Last week the first batch of VIZIO Co-Stars were delivered to customers in the US. The VIZIO Co-Star is the first stream player that comes pre-installed with OnLive cloud gaming via Google TV. 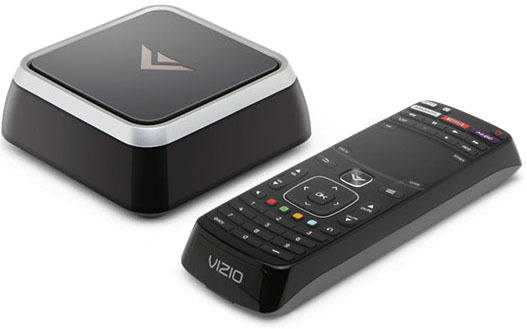 Of course OnLive is very proud of this as they have tweeted: "Exciting news: the first VIZIO Co-Stars (Google TV stream players) w/OnLive built-in have just arrived in customer homes! Cloud Gaming FTW!" If you want to order the $99.99 device from the VIZIO store, you get greeted by this message: "Temporarily sold out. Check back soon." Looks like the device has proven quite popular with the customers, though we don't know what quantity the first batch included. Let's hope that "check back soon" proves true. The VIZIO Co-Star turns any HDTV into the ultimate Smart TV. With 1080p and 3D support; the Co-Star offers the distinct advantage of connecting to a cable or satellite box. This feature allows viewers to enjoy full screen web browsing via Google Chrome with Adobe Flash Player and HTML5, access to entertainment apps such as the OnLive Cloud Gaming Service, Netflix, YouTube and thousands more without switching inputs or remotes thanks to the universal touchpad remote with keyboard and integrated IR blaster. The VIZIO Co-Star is the first stream player to offer video games on demand. Through OnLive, users can demo, watch and play hundreds of top-tier video games directly from the cloud, eliminating the need for an independent game console. In addition, the VIZIO Co-Star offers popular apps such as Amazon Instant Video, YouTube and iHeartRadio and more – all available for download through the Google Play Store. The fact that the OnLive App comes pre-installed on the VIZIO Co-Star surely helps VIZIO sell many of these little stream players. Now that we know that OnLive has an overabundance of servers, let's hope that the new users of the VIZIO Co-Stars can put the overabundance of server resources at OnLive to good use. If you want to know more about the VIZIO Co-Star, here is more info about it.